My wonderful pen friend Carmen hooked me up with this Seven Year Pen that she picked up in NYC a few months back. I had heard of this pen before but never had the opportunity to try one out, so I am really glad she sent this to me to test. According to the insert, the Seven Year Pen "can write two meters a day for seven years" due to its jumbo ink cartridge, long-life tip, and high quality parts. It does seem well made, but compared to most of the pens I use, the medium black ballpoint cartridge doesn't write all that well. And there lies the fatal flaw with the Seven Year Pen - for a pen to last for seven years, you are going to actually have to want to use it for that long. When pens like the Jetstream and Acroball write so much better, it would be hard to pick up this pen despite the eco benefits. I don't want to get too down on this pen at all. It is a fine pen. But, if I am to be expected to commit to this pen for the next seven years when it runs out of ink, it is going to have to be an off the charts great pen. This is more of a novelty item to me. 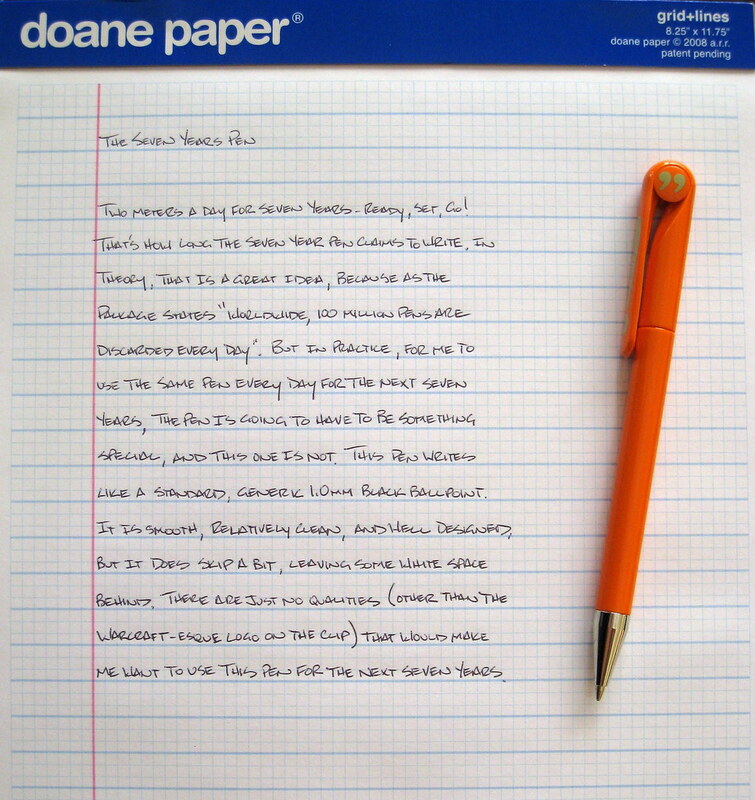 Posted on December 13, 2010 by Brad Dowdy and filed under Ballpoint, Pen Reviews, Seven Year Pen.